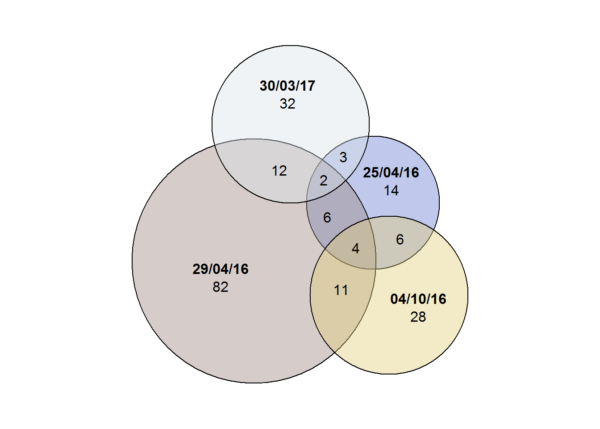 Did Jewish Labour voters turn towards the Conservative Party or the Liberal Democrats in 2017? 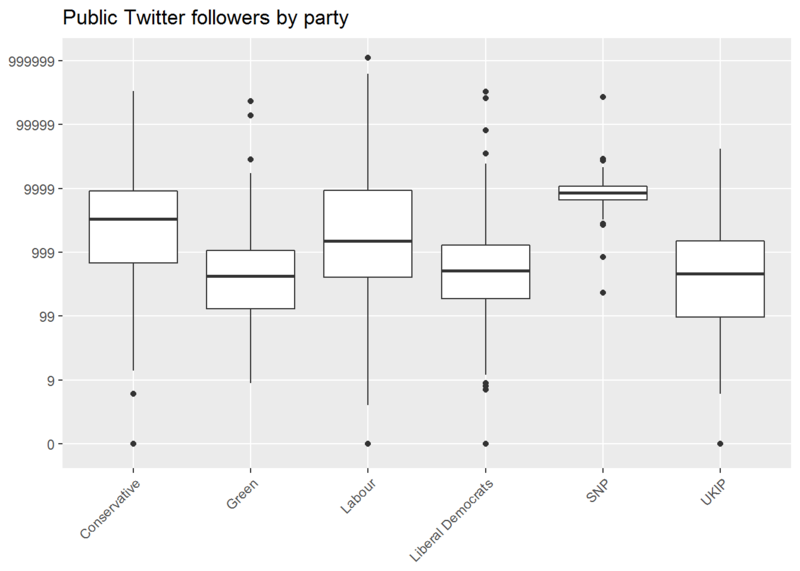 Last week, I published a blog post showing that North London constituencies bucked the national trend by swinging less heavily towards Labour than might otherwise have been expected. 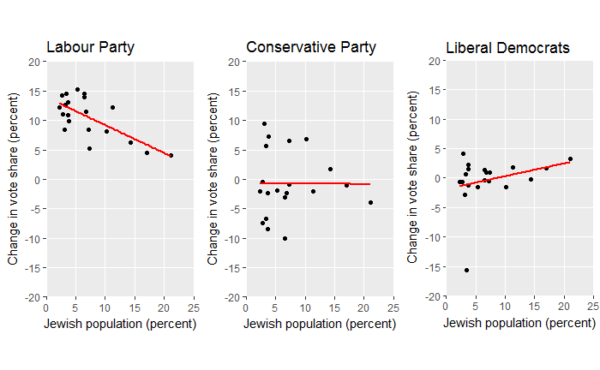 I have since repeated the analysis, looking at changes in votes for the Labour Party, Conservative Party, and Liberal Democrats in the twenty British constituencies with the highest Jewish populations. The findings of that analysis are consistent with the view that many British Jews who had previously voted Labour turned away from the party in response to its continued mishandling of its ongoing antisemitism crisis, but — contrary to some indications that ‘the Tories were likely to take huge swathes of Jewish votes’ — they did not turn towards the Conservative Party. Instead, such voters seem more likely to have voted Liberal Democrat. Author Daniel AllingtonPosted on 26/06/2017 05/05/2018 Categories EssaysTags antisemitism, elections, Labour Party1 Comment on Did Jewish Labour voters turn towards the Conservative Party or the Liberal Democrats in 2017? 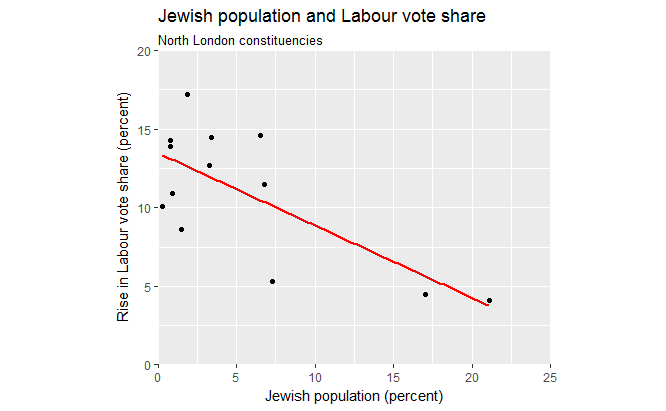 EDIT (12 April 2019): I also analysed 2018 local election results in Barnet: the local authority with the highest Jewish population in the UK. This analysis was reported on the front page of the Jewish Chronicle on 10 May 2018. The UK’s 2017 general election campaign was marred by overt racism against Jews on the part of some supporters of Jeremy Corbyn, perhaps most dramatically expressed in the erection of a vast antisemitic banner in a central location in the city of Bristol. Moreover, it came hard on the heels of the Labour Party’s failure to discipline Corbyn’s long-term ally, Ken Livingstone over his appalling historical distortions with regard to Adolf Hitler and the Zionist movement. The Labour leadership is riding high at the moment, thanks to its less-severe-than-expected defeat in the face of an utterly shambolic Tory campaign. However, there’s been some discussion as to the electoral cost of its failures with regard to the Jewish community (see e.g. Marcus Dysch in the Jewish Chronicle). Can we put a figure on that cost? If we look at voting in the part of the country with the highest Jewish population, we find that two percent more Jews in a constituency implies a roughly one percent smaller rise in Labour’s vote share. Jeremy Corbyn was elected leader of the Labour Party in September 2015, and (following a vote of no confidence and a leadership challenge) re-elected to the same post in September 2016. In February this year, many of those who had re-elected him expressed disappointment at his effectively unconditional support for Conservative Prime Minister Theresa May’s invocation of the Article 50 process to leave the European Union; perhaps to placate them, Corbyn subsequently called for a demonstration in support of those who would suffer the most from EU withdrawal, but then failed to turn up. Part of the public rationale for Corbyn’s three-line whip on the Brexit vote was that if the party opposed it, then that might lead to a loss of support in predominantly working class constituencies in the North and the Midlands that had voted Leave by large margins: constituencies such as Copeland and Stoke-on-Trent Central, where the party nevertheless went on to lose vote share in by-elections later the same month. But despite all this — despite Brexit, which Labour Party members and voters had overwhelmingly voted against, and despite what was arguably the worst by-election performance for an opposition party since the late 19th century (see O’Hara 2017) — Corbyn’s supporters in the Labour Party are still for the most part Corbyn’s supporters in the Labour Party, and they’re not going anywhere — and neither, therefore, is the man himself. Asked whether Corbyn’s continued leadership of the party was a good thing, the answer from sidelined Deputy Leader of the Labour Party, Tom Watson, was pragmatic: ‘It doesn’t matter; that is the situation’ (interviewed in Walker 2017). This impasse will not endure forever: Prime Minister Theresa May has called for an early General Election, and Corbyn (who has been asking for one since December last year) has given his support. But in the six weeks that we have left until the Labour Party is overwhelmingly (and perhaps irreparably) crushed, it may perhaps be worth reflecting on how it got into this appalling mess. 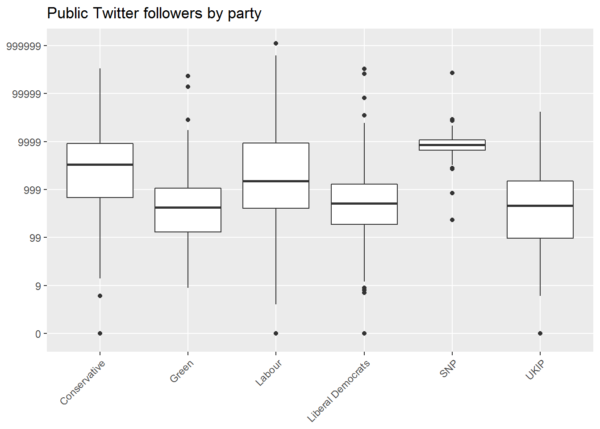 Findings from a recent opinion poll were repeatedly shared on Labour Party-affiliated social media groups over the last weekend. The poll was commissioned by researchers at Queen Mary University of London’s Mile End Institute, and asked people in London both about their voting intentions and about how well they felt that seven particular politicians were doing in their current jobs. Social media users commonly focused on the politicians’ net job approval ratings: that is, the percentage of people saying that each politician was doing well in his/her job minus the percentage of people saying that each politician was doing badly in his/her job. The seven politicians in question were the leaders of the Labour Party, the Conservative Party, the Green Party, the Liberal Democrats, and Ukip (i.e. Jeremy Corbyn, Theresa May, Caroline Lucas, Tim Farron, and Paul Nuttall, respectively), plus the Mayor and the ex-Mayor of London (i.e. Sadiq Khan and Boris Johnson, again respectively). 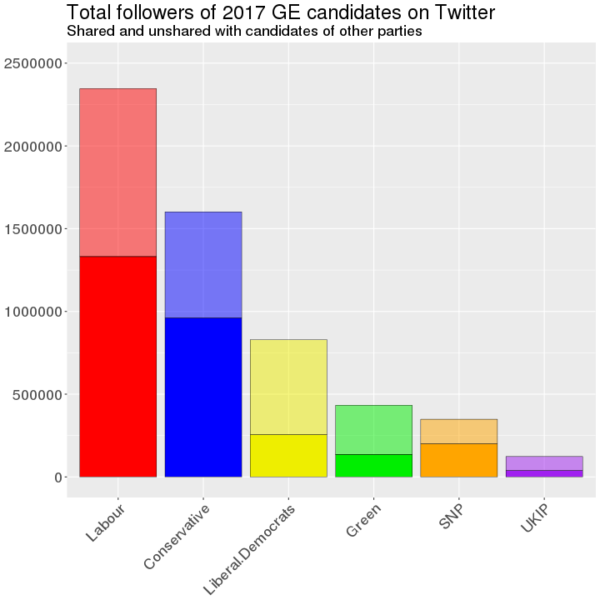 If you are not fortunate enough to spend a little part of each week staring at the slow motion car crash that is political social media, you may also have come across the same poll in newspaper reports that similarly focused on the finding that ‘Jeremy Corbyn has a worse personal approval rating even in London than every other major party leader, including Ukip’s Paul Nuttall’ (Peck, 2017).